Matthew graduated with a BA (and MA) in Computer Science from the University of Cambridge. Immediately following this, he worked for two years in an internet shopping startup company, before returning to the university to work for the Department of Genetics in the FlyMine group for eight years. He then studied for his engineering doctorate with the University of Surrey and the Met Office. 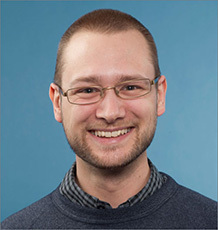 Matthew has developed a keen interest in data analysis and efficient software algorithms for processing data. He has been working in the monogenic diabetes group in the university medical school since 2015. In his spare time Matthew enjoys music, gardening, DIY and mountain walking. Software engineering, data structures and algorithms, databases, data processing, performance optimisation, nonlinear minimisation, variational data assimilation. Stals KL, Wakeling M, Baptista J, Caswell R, Parrish A, Rankin J, Tysoe C, Jones G, Gunning AC, Lango Allen H, et al (In Press). Diagnosis of lethal or prenatal-onset autosomal recessive disorders by parental exome sequencing. Prenat Diagn, 38(1), 33-43. Diagnosis of lethal or prenatal-onset autosomal recessive disorders by parental exome sequencing. Iacovazzo D, Flanagan S, Walker E, Quezado R, Antonio de Sousa F, Caswell R, Johnson MBJ, Wakeling M, Brandle M, Guo M, et al (2018). A MAFA missense mutation causes familial insulinomatosis and diabetes mellitus. Proceedings of the National Academy of Sciences Full text. Laver TW, Wakeling M, Hua JHY, Houghton J, Hussain K, Ellard S, Flanagan S (In Press). Comprehensive screening shows that mutations in the known syndromic genes are rare in infants presenting with hyperinsulinaemic hypoglycaemia. Clinical Endocrinology Full text. Wakeling MN, Laver TW, Wright CF, De Franco E, Stals KL, Patch A-M, Hattersley AT, Flanagan SE, Ellard S, DDD Study, et al (In Press). Correction: Homozygosity mapping provides supporting evidence of pathogenicity in recessive Mendelian disease. Genet Med, 21(3). Correction: Homozygosity mapping provides supporting evidence of pathogenicity in recessive Mendelian disease. The original version of this Article contained an error in the top left of Figure 2: the number 1 on the y-axis had been changed to 0 during the typesetting process. This has now been corrected in both the PDF and HTML versions of the Article. Wakeling MN, Laver TW, Wright CF, De Franco E, Stals KL, Patch A-M, Hattersley AT, Flanagan SE, Ellard S, DDD Study, et al (In Press). Homozygosity mapping provides supporting evidence of pathogenicity in recessive Mendelian disease. Genet Med, 21(4), 982-986. Homozygosity mapping provides supporting evidence of pathogenicity in recessive Mendelian disease. PURPOSE: One of the greatest challenges currently facing those studying Mendelian disease is identifying the pathogenic variant from the long list produced by a next-generation sequencing test. We investigate the predictive ability of homozygosity mapping for identifying the regions likely to contain the causative variant. METHODS: We use 179 homozygous pathogenic variants from three independent cohorts to investigate the predictive power of homozygosity mapping. RESULTS: We demonstrate that homozygous pathogenic variants in our cohorts are disproportionately likely to be found within one of the largest regions of homozygosity: 80% of pathogenic variants are found in a homozygous region that is in the ten largest regions in a sample. The maximal predictive power is achieved in patients with 3 Mb from a telomere; this gives an area under the curve (AUC) of 0.735 and results in 92% of the causative variants being in one of the ten largest homozygous regions. CONCLUSION: This predictive power can be used to prioritize the list of candidate variants in gene discovery studies. When classifying a homozygous variant the size and rank of the region of homozygosity in which the candidate variant is located can also be considered as supporting evidence for pathogenicity. Low KJ, Stals K, Caswell R, Wakeling M, Clayton-Smith J, Donaldson A, Foulds N, Norman A, Splitt M, Urankar K, et al (In Press). Phenotype of CNTNAP1: a study of patients demonstrating a specific severe congenital hypomyelinating neuropathy with survival beyond infancy. Eur J Hum Genet, 26(6), 796-807. CHN is genetically heterogeneous and its genetic basis is difficult to determine on features alone. CNTNAP1 encodes CASPR, integral in the paranodal junction high molecular mass complex. Nineteen individuals with biallelic variants have been described in association with severe congenital hypomyelinating neuropathy, respiratory compromise, profound intellectual disability and death within the first year. We report 7 additional patients ascertained through exome sequencing. We identified 9 novel CNTNAP1 variants in 6 families: three missense variants, four nonsense variants, one frameshift variant and one splice site variant. Significant polyhydramnios occurred in 6/7 pregnancies. Severe respiratory compromise was seen in 6/7 (tracheostomy in 5). A complex neurological phenotype was seen in all patients who had marked brain hypomyelination/demyelination and profound developmental delay. Additional neurological findings included cranial nerve compromise: orobulbar dysfunction in 5/7, facial nerve weakness in 4/7 and vocal cord paresis in 5/7. Dystonia occurred in 2/7 patients and limb contractures in 5/7. All had severe gastroesophageal reflux, and a gastrostomy was required in 5/7. In contrast to most previous reports, only one patient died in the first year of life. Protein modelling was performed for all detected CNTNAP1 variants. We propose a genotype-phenotype correlation, whereby hypomorphic missense variants partially ameliorate the phenotype, prolonging survival. This study suggests that biallelic variants in CNTNAP1 cause a distinct recognisable syndrome, which is not caused by other genes associated with CHN. Neonates presenting with this phenotype will benefit from early genetic definition to inform clinical management and enable essential genetic counselling for their families. Satellite infrared sounders are invaluable tools for making observations of the structure of the atmosphere. They provide much of the observational data used to initialize atmospheric models, especially in regions that do not have extensive surface-based observing systems, such as oceans. However, information is lacking in the presence of cloud, as the cloud layer is opaque to infrared radiation. This means that where information is most desired (such as in a developing storm) it is often in the shortest supply. In order to explore the mathematics of assimilating data from cloudy radiances, a study has been performed using an idealized single-column atmospheric model. The model simulates cloud development in an atmosphere with vertical motion, allowing the characteristics of a 2D-Var data assimilation system using a single simulated infrared satellite observation taken multiple times to be studied. The strongly nonlinear nature of cloud formation poses a challenge for variational methods. The adjoint method produces an accurate gradient for the cost function and minimization is achieved using preconditioned conjugate gradients. The conditioning is poor and varies strongly with the atmospheric variables and the cost function has multiple minima, but acceptable results are achieved. The assimilation system is provided with a prior forecast simulated by adding random correlated Gaussian error to the truth. Assimilating observations comparable to those available from current geostationary satellites allows vertical motion to be retrieved with an error of less than a centimetre per second in most conditions. Moreover, evaluating the second derivative of the cost function at the minimum provides an estimate of the uncertainty in the retrieval. This allows atmospheric states that do not provide sufficient information for retrieval of vertical motion to be detected (such as a cloudless atmosphere or a non-moving opaque cloud layer in the upper troposphere). Retrieval is most accurate with upwards motion. © 2014 Royal Meteorological Society. Smith RN, Aleksic J, Butano D, Carr A, Contrino S, Hu F, Lyne M, Lyne R, Kalderimis A, Rutherford K, et al (2012). InterMine: a flexible data warehouse system for the integration and analysis of heterogeneous biological data. Bioinformatics, 28(23), 3163-3165. InterMine: a flexible data warehouse system for the integration and analysis of heterogeneous biological data. SUMMARY: InterMine is an open-source data warehouse system that facilitates the building of databases with complex data integration requirements and a need for a fast customizable query facility. Using InterMine, large biological databases can be created from a range of heterogeneous data sources, and the extensible data model allows for easy integration of new data types. The analysis tools include a flexible query builder, genomic region search and a library of 'widgets' performing various statistical analyses. The results can be exported in many commonly used formats. InterMine is a fully extensible framework where developers can add new tools and functionality. Additionally, there is a comprehensive set of web services, for which client libraries are provided in five commonly used programming languages. AVAILABILITY: Freely available from http://www.intermine.org under the LGPL license. CONTACT: g.micklem@gen.cam.ac.uk SUPPLEMENTARY INFORMATION: Supplementary data are available at Bioinformatics online. Lyne R, Smith R, Rutherford K, Wakeling M, Varley A, Guillier F, Janssens H, Ji W, Mclaren P, North P, et al (2007). FlyMine: an integrated database for Drosophila and Anopheles genomics. Genome Biol, 8(7). FlyMine is a data warehouse that addresses one of the important challenges of modern biology: how to integrate and make use of the diversity and volume of current biological data. Its main focus is genomic and proteomics data for Drosophila and other insects. It provides web access to integrated data at a number of different levels, from simple browsing to construction of complex queries, which can be executed on either single items or lists. De Franco E, Lytrivi M, Patel K, Igoillo-Esteve M, Wakeling M, Haliloglu B, Unal E, Godbole T, Yildiz M, Ellard S, et al (2018). Mutations in YIPF5 are a novel cause of neonatal diabetes, highlighting the critical role of endoplasmic reticulum-to-Golgi trafficking in human beta cell survival. Author URL. Laver T, Wakeling M, Knox O, De-Franco E, Flanagan S, Colclough K, Ellard S, Hattersley A, Weedon M, Patel K, et al (2018). Redefining the pathogenicity of Maturity Onset Diabetes of the Young (MODY) genes: BLK, PAX4 and KLF11 do not cause MODY. Author URL. Janssens H, Lyne R, Smith R, Guillier F, Ji W, McLaren P, Riley T, Reisinger F, Rutherford K, Wakeling M, et al (2006). Flymine: an integrated database of Drosophila and anopheles genomics. Author URL.